This is a little different from what I usually review but Michael Perry is a Wisconsin author that writes about life in Wisconsin in a very fun way. This is his debut into fiction waters and I just had to share it with you. This was a wonderful read. I love stories set in my own state. Michael Perry dips his unique writing style into the fiction well and I loved it. In The Jesus Cow we visit Swivel, Wisconsin on Christmas Eve as Harley Jackson’s cow gives birth to a very special calf. Harley is unsure what to do until Hollywood comes to town and turns his life and the town of Swivel upside down. Farming, religion, politics, housing recession, ecological concerns, romance, neighborly feuds, and even a bit of scandal come together in the very satirical portrait of small town life. The people of Swivel are those you could find in any small town. They all have their causes and quirky behaviors. Harley Jackson hasn’t had much luck in the finding true love. He is happy working his job, tending his “beefers” and being part of the volunteer fire department. I like Harley, he is different. He is introverted and was brought up in a very religious home but has lost his faith. When his calf is born with a clear picture of Jesus Christ on its side he truly wonders if it’s a sign. He remembers the teachings pf his mother. Good Christians do not draw attention. When his secret gets out he is really in a quandary about what to do. Michael Perry is an incredible storyteller. He has created interesting characters and a town for them to come together and be observed in a way only he can. The story in funny and touching and does have a message. Those that already loved Perry’s non-fiction works will love this. If he is a new author to you this is a great place to start. Find out more about Michael Perry and his work on his webpage here. Michael Perry is a new author for me, and his book sounds delightful. Thank you for the giveaway. I’ve been keeping an eye out for this one, looks like a good read with some quirky characters. Thanks for reviewing this book, Lori. 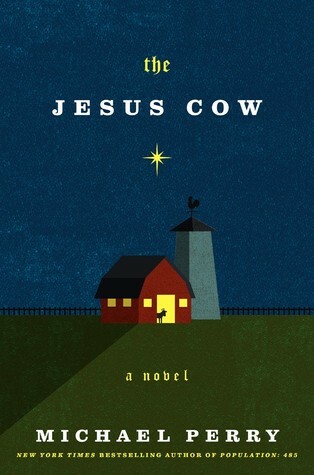 The Jesus Cow sounds like a fresh, entertaining story. I wonder if “Holy Cow” was an alternative title!